Introducing the newest, super-cool RGBA 4-in-1 LED PAR can that is unique, bright, and packed with features; meet the LB PAR™ Quad RGBA. These fixtures are specifically designed to keep up with the rigorous demands of life on the road! 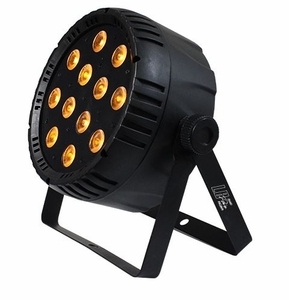 Whether you are a mobile DJ, in a working band, or just want quality lighting for any permanent installation, you will love what the LB PAR™ Quad RGBA has to has to offer from its 12* high output 10-watt RGBA 4-in-1 LEDs, to its stunning physical features which include a very durable, scratch resistant composite housing w/ dual mounting brackets for flexible positioning. All the features one can hope for are loaded into the LB PAR™ Quad RGBA including 12 incredible built-in programs with auto mode, sound active mode, strobe effects, and 16-bit or 3 user selectable 32-bit dimming curve options. It can perform full RGBA color mixing with 4/9-channels of DMX, or simply be controlled via its easy-to-use 4-button LED control panel. The LB PAR™ Quad RGBA also comes with equipped with PowerCON™ compatible AC in/out and DMX in/out jacks. And as course, LB PAR™ Quad RGBA fixtures are backed by Blizzard’s 2-year warranty!